Following on from cheetor's lovely Squat miner, it's my turn in the 'Choose Your Own Adventurers' series. According to Wikipedia (on the subject of Theosophical beliefs) "humans had in far ancient times an actual third eye in the back of the head with a physical and spiritual function. Over time, as humans evolved, this eye atrophied and sunk into what today is known as the pineal gland...by extending an "etheric tube" from the third eye, it is possible to develop microscopic and telescopic vision." I suspect on the basis of this, and other spiritual beliefs, the concept of the Imperium's Navigators was born - after all, they have a third eye and can see weird stuff! 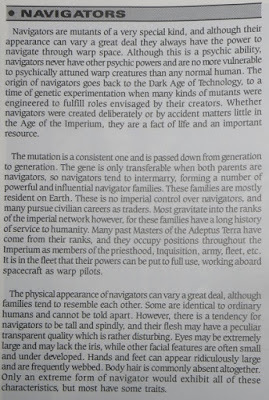 The Adventurers range gives us one of two Navigators that Citadel have released (the other being a much more recent Forgeworld event miniature). 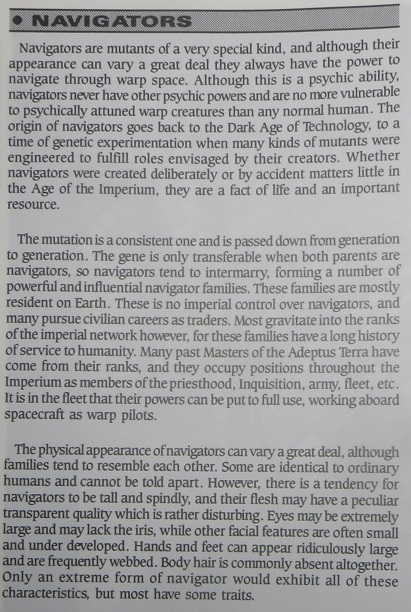 The Navigator possesses some of the weird anatomy referred to in the Rogue Trader rulebook - the spindly legs, the oversized hands, the bulbous head and protruding eyes. He's an ugly misfit wearing a bizarre costume that suggests wealth with all the flounces and frills. In short, a perfect representation of a Navigator. My version of the gangly fellow is Phineas - Inquisitor Clousseau's personal Navigator from House Saq D'os. I decided that I wanted his warp eye to be concealed, so modified the figure with a sculpted bandanna. In terms of colours, I wanted to reflect my previous Navigator, Ryaph, from the same house, so adopted the same black with flashes of colour. Navigator Phineas sports a natty little fur stole, along with his bows and puffed sleeves! Having completed the last member of Clousseau's companions, I can also reveal the display base I made to show them off. This is made simply from an oval movement tray and display plinth. I added some resin barricades to the movement tray, then sanded the whole thing, before painting and adding some static grass and tufts. I also added a few cables and chains as a little additional piece of visual interest. 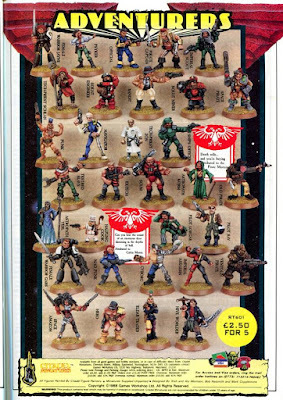 Hopefully the group of figures hang together nicely - they're an eclectic, exotic and interesting group - ideal for an Inquisitorial retinue! Coming next will be another new adventurer from the talented hands of Curis over at Ninjabread. Great work! 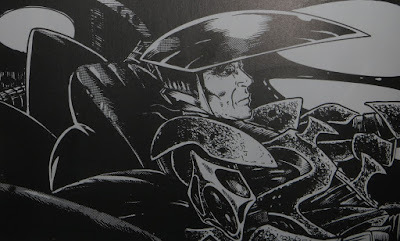 He works really well as part of the group overall, balancing the colour scheme of the retinue. Nice work getting down the pale skin, that really stands out as part of your group. I remembered them having bulbous heads and gangly limbs, but never deformed hands – thanks for bringing up that bit of fluff. I feel much better about painting my copy of the casting now that there's an excuse for why his hand is bigger than his waist. The concept of Navigators as artificially mutated humans, with a bulbous heads, tiny facial features, able to navigate spaceships impossible distances through their psychic might is based wholesale on Dune, where they had Navigators who were artificially mutated humans, with a bulbous heads, tiny facial features, able to navigate spaceships impossible distances through their psychic might and loved spice orgies. I particularly like the bandana idea, looks natural on the mini and adds fluff flavour. Cool job on this one. Thanks Suber! It was either a bandana or a sculpted third eye - in the end I fancied the navigator with his safety 'on'! 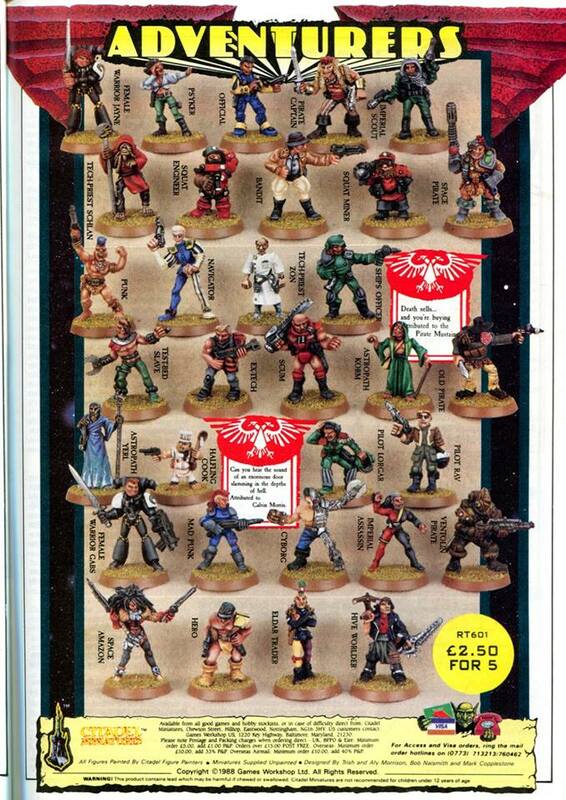 That goofy old Navigator is one of my favourite 40k sculpts simply because it was the only released exploration of a fun but rarely seen part of the setting (I read Rogue Trader before I read or saw Dune). On top of that to me, the Navigator is the poster boy for the eclectic Adventurers range. You did a nice job on him Axiom. He slots into your display group perfectly: they look very retro-chic resented nicely like that. For many years, I thought this figure was rubbish. But once you the up the background and the sculpt, it makes sense. And now I love him, goggly eyes and all. Nice Jon! I think Bloo is still looking for one. LMAO Sculpting that bandana tho simple really takes the mini to a new level. I think he fits this quirky band perfectly. ;) Nice work M8. Thanks Tom! The bandana makes him mine. All mine. Blue can't have him!! One day we'll find one for him! A well painted eclectic mix of old skool minis. Navigators are a great part of the 40k lore, and this guy fits the part without leaning too far to the weird mutant side of the scale. The bandanna is a nice touch too, as it suggests the third eye without the need to show it off. He's a fun sculpt absolutely. I considered sculpting the eye, but for this guy I fancied him in 'safe' mode. The flashes of colour were just enough to make the mini 'pop' so to speak. Nicely done axiom. Thanks very much. I wanted a little touch of colour to contrast with the black.